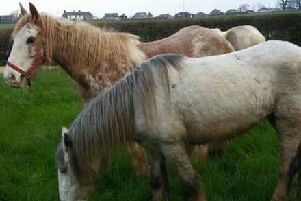 A pony was rescued by firefighters from the River Lune near Snatchems in Lancaster Road, Morecambe at 7am on Thursday, April 4. A pony has been rescued by fire crews after becoming stranded on a small island in the River Lune near Snatchems in Morecambe. Lancashire Fire and Rescue Service (LFRS) launched the water rescue mission to save the distressed pony at 7am this morning (Thursday, April 4). The pony had been spotted at dawn on a slowly shrinking parcel of land in the River Lune, near the Golden Ball Hotel at Snatchems, off Lancaster Road. A fire service spokesman said: "A pony was stranded on a small island in a stretch of river near Lancaster Road, Snatchems, Morecambe. "Two fire engines and crews, from Morecambe and Lancaster, responded and firefighters equipped for carrying out rescues from water brought the pony safely to dry land." The fire service confirmed that the pony was uninjured.